For a lot of hunters, scent control is only practiced during hunting season and a few weeks before season. True scent control for deer hunters should be a year round activity. Unfortunately for most of us, we only have one set of hunting gear that we use for all types of hunting – coyote, deer, turkeys, etc. With each style of hunting there are different areas of concern regarding scent control. There are the hot days of spring when hunters walk through the hills chasing turkeys, all while working up a sweat. There are the damp cold days in November sitting in our Muddy tree stands waiting on a rut crazed buck. Even the snow covered days in January calling in coyotes. All of these hunts bring moisture and ultimately odor to one key area of your hunting gear – boots. The tools we use to help with our scent control! The boots you wear to your tree stand are one of the most likely pieces of your gear to spook game due to their smell. You sweat in them, you walk through mud puddles in them, and you walk through creeks with them, every step you take while hunting is in your boots. That’s why it’s extremely important to take care of your boots and maintain proper scent control. I believe every pair of boots has an “odor life.” Of course when you buy your boots they have a “new” scent to them. Once that odor is removed and they’ve been properly taken care of, they now enter into the “boot life.” If boots are taken care of properly they can last several hunting seasons, but there are numerous things to avoid. Not wearing them in gas stations, walking through the mall, hiking, anything that clogs them with foreign odors is key. 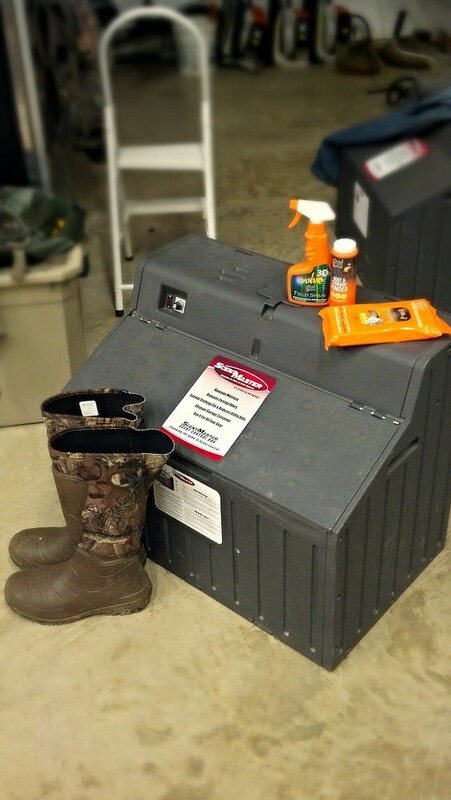 Keeping them clean, dry and stored before each hunt is the best way to increase their life. We treat boots after every single hunt with Dead Down Wind foot powder. This powder absorbs the moisture and destroys the odor, making sure the next time out our boots are as odor free as we can get them. Next we’ll spray the outside of our boots with Dead Down Wind field spray. This destroys any odor on the outside of our boots that may have collected during the hunt. Then we place them in our ScentMaster Box and turn it on, making sure as much odor as possible is removed from our boots. The box will heat up to 130 degrees, removing any moisture remaining in the boot and also filtering out any other odors that might have been missed. This system not only controls a huge part of our odor but it also greatly increases the life of our boots! Don’t postpone your scent control this summer just because deer season is months away. Fight the odor now and tag your buck this fall!